Nippy mornings always call for warm chocolate chip muffins with a hot mug of any divine beverage but an Earl Grey cuppa would always be my first choice. Although I have always preferred to make muffins from scratch, this particular morning I chose to use Pioneer Buttermilk Biscuit & Baking Mix and I must say the end result was pretty satisfactory as in 10/10! 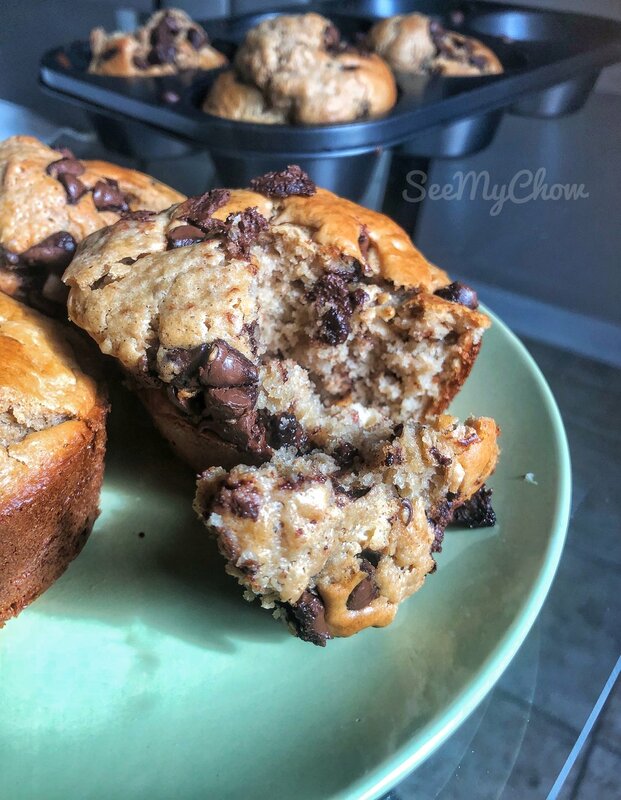 The mix involves adding milk, egg and any other ingredient of your choice so why not a classic chocolate chip, with crushed almonds and a dash of instant coffee granules? Chocolate chips are available in major supermarkets throughout the city and for the coffee granules just grab a bottle of Nescafe Gold or Classic Coffee. You can make the muffins from scratch using this recipe as well and add the rest of the ingredients. Here is the easy recipe to make these insanely delicious muffins. Muffin pan, pastry brush, plastic spatula, glass bowl, whisk. Combine first five ingredients into a glass bowl. Mix through with a spatula. Beat egg and milk together with melted butter. Pour milk mixture into the dry ingredients and gently mix through with whisk. Lightly oil the insides of the muffin pan using the pastry brush to prevent the muffins from sticking inside the pan. Preheat oven at 350 degrees and bake for 25minutes. What I loved most about these beauties was the perfect balance of sweetness of the chocolate chips with the bitter flavour of the coffee. The sugar wasn’t also overwhelming which makes it a perfect treat for both breakfast and brunch. The inside was perfectly moist and the crunch of the almonds was a delightful surprise in each bite. Have a go at this recipe and when you do, tag @seemychow on Instagram for a gram feature! Happy baking! Raisin Coffee Pancake Muffins Recipe. You have to forgive me for this but I had to use a quick Pancake mix for man was too hungry to look for pancake ingredients. Forgive me!! I didn't make boring pancake muffins however. I was going to make Raisin Coffee Pancake Muffins! Recipe for Vegan Yam Patties. This recipe is perfect for vegans unlike the yam balls I made some time back which had sausages stuffed in them. It comes mixed with a delightful mix of veggies to balance out the carbs in the yam. Christmas Raspberry Jam Thumbprint Cookies Recipe. That’s why these Christmas thumbprint cookies are the perfect cookies to make this holiday and share as a thank-you gift to friends and family. Ward Off Chilly Days & Nights With This Easy Soul-Warming Chicken Light Soup Recipe. 8 Cooking Tips & Recipes To Reduce Food Waste Towards #ZeroHunger.